Want my personal help with your Facebook Ad Campaigns? Here’s another client case study for you! It reveals how we turned $513 into $15,840 in sales in just a few weeks. This video breaks down the actual ad we used and how we went about building our custom audiences. Feel free to swipe it for your retargeting campaigns. Been following you for a while and I’m very impressed. You’ll be hearing from me soon. Question, what’s your take on Click Funnels? I’m thinking of using click funnels to build my launch when I release my product in about 30-40 days (thinking Jeff Walker style launch). Most of my advertising will be done on FB. Anyway great stuff as always. Great Case study, it always surprises me that there aren’t more business using retargeting especially when you see results like that! Think I will share this over on our Facebook page as its a really powerful reason to start retargeting! This was great thanks for that! I had heard about retargeting before but had never got around to trying it before will defiantly be giving it a go now. Thank you for sharing! Dude this is gold. I’m gonna set this up soon. This is the product url at the same time. If I create a campaign for this URL the campaign will show the ads for people who buy my product already as well right? So people who bought the product already might get pissed at me in this case. Is there a solution for that? Yes, there is a solution for that. When you set your campaign audience up you exclude people who have already converted. Great video and very informative. Question, can you make the purchase on the actual site of your client? 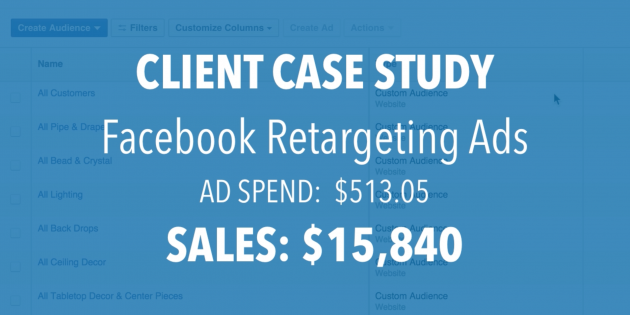 If so, why don’t you use the facebook pixel tracking to track actual revenue purchased from each conversion which will give a more precise ROI. Rather than using checkouts and multiplying the AOV. In addition, what constitutes a checkout? Is a checkout an actual purchase?